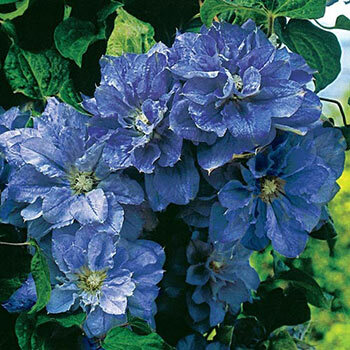 Hardy vines are literally covered with flamboyant blooms. Flower Form: 5 - 7" double blooms. Planting Instructions: Provide shade for their roots by over planting with annuals or shallow rooted perennials, set a large flat paving stone over root zone, or mulching. Soil Requirements: Rich, well-drained porous soil. Growth Rate: Slow to establish, don't give up too early. Fast once established to location. Pruning: Can be pruned back hard after flowering above 2nd or 3rd set of buds. Early spring.